Dimension of Disaster is the 200th quest released into the game. It takes place in New Varrock, an alternate version of Varrock where you never existed. The city has been taken over by a necromancer named Zemouregal, and he has killed off almost all of the inhabitants and reanimated them as zombies. It contains four subquests and is a blockbuster. Can you be there hero of two worlds? 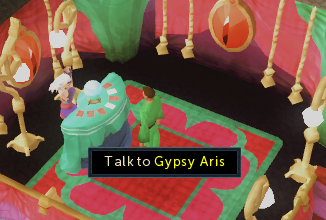 Speak to Gypsy Aris in Varrock. To begin, speak with Gypsy Aris in the tent southwest of Varrock Square. Ask her about Dimensions of Disaster. She will offer you to read your fortune for one coin. Accept this and the quest and she will read your fortune. She will look into the crystal ball and ask you about your past as an adventurer. It does not matter what you say about it (though it can be fun to take the It's a Wonderful Life approach and say the world would be better without you). She will look into the fortune and suddenly gasp at what she sees, being so shocked that she cannot tell you your fortune and will hand you the coin back. She will refuse to speak to you about the subject again. You should notice that the coin she gave you has not gone into your money pouch. This is because it's not quite like your other coins. Investigate it and choose the flip option. You will now find the coin has the head of a mysterious figure. Return to Gypsy Aris who will tell you that the figure is a necromancer named Zemouregal and he has taken over the Varrock of an alternate timeline. She gives you the quest of freeing this Varrock from Zemouregal's tyranny. Toss the coin into the Varrock fountain and enter the dimension portal. You will be greeted by the image of Zemouregal. Zemouregal will be aware of who you are and openly challenge you to stop him. 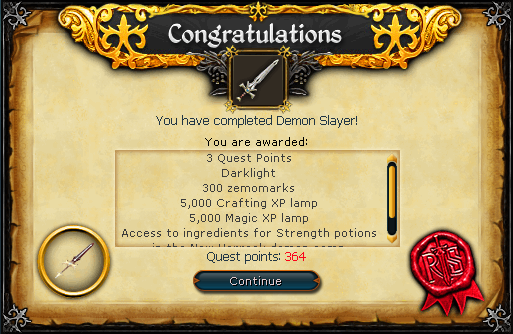 After this, congratulations, you have just earned the easiest quest point ever! Here in New Varrock you will be starting afresh. You will have to gain all items to complete the quest in this alternate dimension. Items can be bought, stolen, or traded by other players (there is no Grand Exchange here however). The currency here is zemomarks. The best way to get zemomarks is by opening chests located around the city for gems, cutting the gems (preferably, uncuts work but not to the same extent), and then selling these gems to the gem or general store. Opening chests require a lockpick (gained after you join a gang, hence joining a gang should be done first) and a certain thieving level. If your thieving level is 1, you will be to a disadvantage but you should still be able to survive by completing tasks or selling items to stores. For sole purposes of completing this quest, you will not need a ton of zemomarks. Don't worry about gearing yourself; it is unnecessary. Zemouregal hints that you should arm yourself before you face him, but there is a twist to this which we'll deal with later on. Gather zemomarks as you need them. You should be able to mainly suffice on the zemomarks you gain from quest rewards. There are four subquests in this quest. It is suggested that you do them in the following order, however they can be done in any order (except for the Curse of Arrav, which must be done last). Skills: Must defeat a low-level unarmed enemy with scaling lifepoints. Speak to Orlando Smith in the Varrock Museum to begin. He will ask you if you're interested in getting the shield back. Accept this. You do not need to join your gang on the normal timeline but you do need to pick a gang. Speak to Katrine in the Black Arm hangout in the southwestern part of the city. Tell her you want to pull off a bank job and she says that you'll need to join the gang first. To join, you'll need to retrieve her arm. The arm has been stolen by Jonny the Beard, a Phoenix Gang member who frequents the Blue Moon Inn. Head to the Blue Moon Inn (it's the bar inside the city a few steps outside of Black Arm Gang hideout) and speak to Jonny the Beard. Ask him for his arm and he'll eventually fight you. 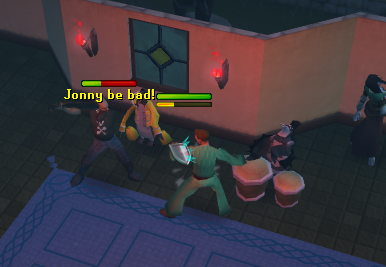 The fight can be won without a weapon as Jonny will do no damage to you. Now return the arm to Katrine, who will allow you to join the Black Arm Gang. Enter the room to the north and speak to Moira, who will hand you two forged documents you need to gain access to the Shield of Arrav halves. Head to either West or East bank and speak to the skeletal clerk (the clerk in the east bank is upstairs) and ask for the Shield of Arrav. You will get both halves. Combine these halves to get the Shield of Arrav . Return to Orlando Smith with the shield to finish the subquest. Speak with Baraek and ask him about the Phoenix Gang. He will ask for two zemomarks, which you should give him. He will tell you the location of the Phoenix hideout. Now, speak with Straven south of Aubury's rune shop and tell him you know who he is. He will agree to help you steal the Shield of Arrav if you can join the gang. He will tell you the mascot of the Phoenix gang (a Phoenix) has been stolen and must be returned. He will tell you to check with Lowe the archery salesman about it. He will tell you the Phoenix and its eggs are upstairs. You should see a moving egg in the southeast corner of the room. You must get it, but you cannot step on any other eggs. Follow the path below. It's suggested you take it one or two steps at a time to prevent accidentally walking on an egg. Return the egg to Straven, who will say he wanted an eggling, not an egg. Woops! To correct the problem, you are given the option of complimenting, shouting at, clapping at, or kicking the egg. You will now be given the chance of joining the Phoenix gang, which you should accept. Head over to Molly next door and speak with her. She will give you two forged documents for the Shield. Head to either West or East bank and speak to the skeletal clerk (the clerk in the east bank is upstairs) and ask for the Shield of Arrav. You will get both halves. Combine these halves to get the Shield of Arrav . Return to Orlando Smith with the shield to finish the subquest. Skills: Must defeat a level 32 animated book and level 60/63 avernic demons. To begin, speak with Gypsy Aris (in New Varrock) who will offer you the quest of defeating Delrith. Accept it and she will tell you to speak with Sir Prysin. Sir Prysin can be found across the Varrock Church in the northeastern part of town. He will tell you to search for his cellar key. The key can be found in a drain on the southern side of the house or the chest drawers of his bedroom. Travel down the Church cellar and attempt to take Silverlight. You will be stopped by the barrier around Silverlight. Head back to Gypsy Aris and she will tell you that the spirits guarding the sword have left the cellar. To help find them, she will hand you a spirit measure . Activate the spirit measure to determine in what direction the spirits are. If you are near a spirit, you should get "Woo!" in your chat box. The more messages the better. When you are very close to a spirit, you should see a long "WooOoooOoo!" The first spirit is located in Dr. Harlow in the Blue Moon Inn. He will refuse to allow you to sober him up, so head to the Apothecary and ask him to make a potion to sober up Harlow. He will ask for a cabbage, a rotten tomato, and the hair of a dog. Cabbages can be retrieved by pickpocketing zombies around town. You can get a rotten tomato near the jail cells east of the General Store. Finally the hair of a dog can be received by putting your hand in a kennel just northwest of the Apothecary. Reach your hand to the right, left, and then further in. When you remove your hand, you should have some hair. Give these ingredients to the Apothecary and you will get a sobreity potion . Head back to the Blue Moon Inn and buy a beer for two Zemomarks. Use the potion on the beer and give the beer to Harlow (keep the vial the potion came in for it will be used later on). The Spirit of the Body will emerge. Talk to him and he will tell you that you need to kill any pub goer to prove your worth. If you don“t want to kill a pub goer, you can get him to kill yourself (you will respawn in Varrock Square with no items lost). Kill a zombie or get the spirit to kill you to get the spirit to remove his barrier from Silverlight. 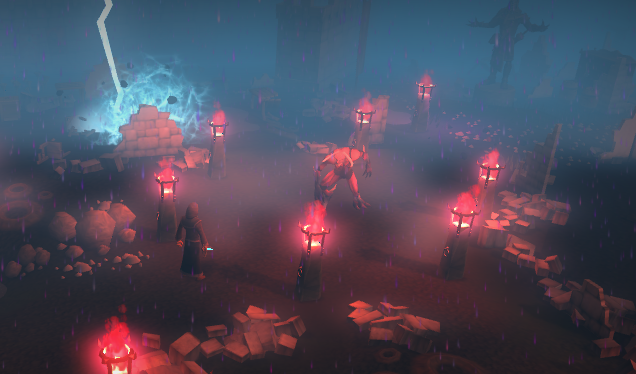 The next spirit is found in the graveyard in the northwest corner of the city - where the Grand Exchange entrance would normally be. 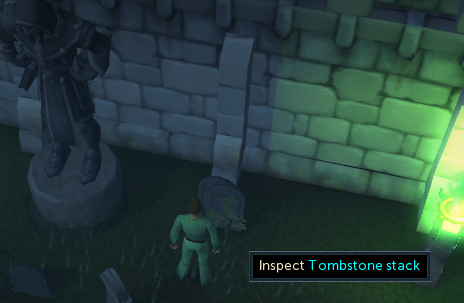 Inspect a tombstone stack to summon this spirit. He will seem annoyed that you have summoned him and will tell you to take a step to the right. Take a step to his or your right and you the spirit will lower the barriers on the sword. The final spirit is found in a bookcase in the building south of Sir Prysin's house. 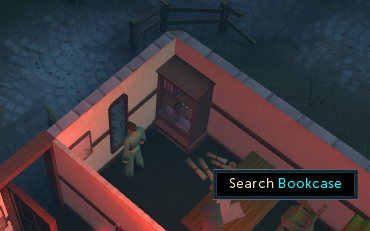 After searching the bookcase, a level 31 animated book will fly out and attack you. The book should be fairly easy going if you have a mithril crossbow. Try to conserve ammo by using more abilities and less auto attacks. After killing the book, the spirit will appear. He will humorously ask how the experience went, thinking you were a random passerby and not a hero looking for Silverlight. He will ask you several questions. It doesn't matter if you answer these correctly or not because either way you will get the spirit to lower the barrier. Run back down to the Church cellar and retrieve Silverlight. Now, try to head through the walled off area of southeast Varrock and you will be stopped by Evil Dave. He won't allow you into the walled off area until you're wearing a black costume and a black sword. Pick some black ink mushrooms next to Dave and use them on Silverlight. This will dye Silverlight black in the process. Next, head to Thelassia and buy a full set of black robes, totaling 90 Zemomarks. Once you have these things, wield them and speak to Dave. He will allow you into the walled off area. Speak to Delrith. Shockingly, Delrith will be fairly friendly and on your side - he wants to be killed so he can return to his home plane, Infernus. When you try to kill him however, another Demon named Agrith Naar will interfere. Delrith will ask you to draw a circle of blood. Head out of the walled off area and use your vial on the blood fountain outside of Horvik's smithing shop to obtain a vial of blood . Return to Delrith and draw the ritual circle. Delrith will say an incantation in Latin (translated to English, the incantation is "He applied to be the Drunken Dwarf, but failed the intelligence test"). Now, stab Delrith and he will be replaced with Agirth Naar. Attack Agrith Naar. When Naar yells "PREPARE TO BE INCINERATED!" run away until the attack is complete (if common sense didn't tell you that already). During the fight, Agrith Naar will also summon three Lesser Demons which will heal him. Kill these demons and then kill Naar. Once you have killed Naar, Silverlight will absorb Naar's essence and turn into Darklight. Return to Gypsy Aris for your reward. Skills: 43 Magic, Must defeat a level 42 armoured zombie, weak to Magic. To begin, speak with Reldo in the New Varrock castle. He will tell you he is close to finding the bloodline of the royal family of Varrock. Tell him it's Dimentheis and he will be concerned - Dimentheis was eaten alive by rats! He says the only way to repel Zemouregal now is to give the shield to Arrav himself. Talk to Arrav in the center of the castle and ask him if he would be interested in taking down Zemouregal. He appears interested. Now, speak with Reldo. He will tell you to search for a book dealing with Arrav's curse. Search the northwestern most bookshelf to find Heart Magic Notes . Skim through this and return to Reldo. Reldo will tell you to smash an obsidian prism behind a decoder door. To do this, you'll need a disguise. Head over to Thessalia, the clothes store owner, and buy a full set of zombie armor for 500 Zemomarks. Return to the Varrock Castle and try to open up the throne door behind Arrav. It will be locked, but you will be able to eavesdrop on a conversation between Zemouregal and his gargoyle. Now, with your full zombie suit equipped, head up the southeastern staircase and kill an armoured zombie. This will leave a plume of red mist behind which can be contained by using an empty vial on the plume. Now head to the eastern room with armoured zombies and search the crate of decoder strips to obtain decoder strips. Once you have the strips, listen to Zemouregal talk to his gargoyle over the Balcony. You should hear something about a tin soldier. Exit the castle and obtain a tin soldier head from the trial announcer at Varrock East Bank, buy a nature rune and get four free fire runes from Aubury, and buy three tin ore from Sani south of Varrock West Bank. Re-enter the castle and head up stairs. 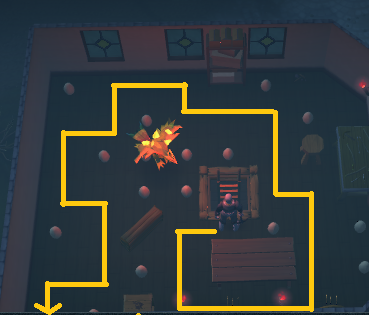 Take the first red barrier door and continue west until you find a room with a broken tin soldier. Fix this soldier up and pour your vial of red gas on it. Exit the red barrier areas, kill another armoured zombie to refill your vial, and enter the northwestern most room. Click on the scrying pool and select the control tin soldier option. Now controlling the soldier, head your way to the room north of the toy soldier room. Read Zemouregal's notes to find out the four digit code (it is different for everyone). Return to the treasure room in the northwest part of the second floor and attempt to open the room safe in the northwest. Use the method illustrated in the Curse of Arrav quest guide. Once inside, break the prism and speak to Arrav to finish the subquest. To begin, speak with Arrav and accept the quest. You're going to need four items : canopic jar, sacred oil, dwellberries, and a ring of life. For the canopic jar, you'll need to speak to Ernie. Ernie can be found upstairs in the building directly east of Aubury's rune shop. Ask him for a canopic jar and he will say he will give you one if you can fill a medium sized cooking urn. To do this, cook ten pieces of raw meat (killing undead cows is the fastest way to do this). Once full, return the urn to Ernie in exchange for a canopic jar. Return to Varrock Castle and enter the red barrier room east of where Arrav is standing. Search the dead gnome Ambassador Ferrnook, who conveniently was carrying dwellberries with him when he died. Speak to Father Lawrence, who will complain about Saradomin's abandonment of his people. You will say otherwise and Lawrence asks you to prove it. Pray at the altar and switch to prayers if you are on curses. Activate ultimate strength and speak to Lawrence. Next do the same thing with rapid restore, eagle eye, protect from summoning, and mystic might. Following this, Lawrence will hand you a bottle of sacred oil. Head over to Urist Loric in Varrock Square and buy a ring mould and an uncut diamond (uncut diamonds can also be looted from chests). Cut the diamond. Next buy some gold ore from Sani, smelt it into a gold bar at the nearby furnace, and then create a diamond ring. 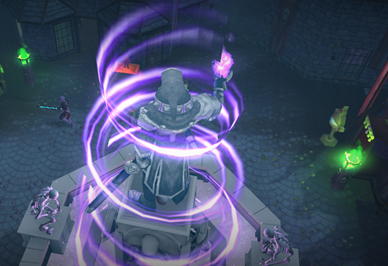 Buy one cosmic rune and 10 earth runes from Aubury and you will now have a ring of life. Fill the canopic jar with sacred oil, dwellberries, and a ring of life. Now, return to Arrav, who will tell you that you'll need orange and purple mists on top of the red mist. The colors of the mist can be changed via dyes. Speak to Thessalia about these dyes. For the yellow dye, you'll need a vial of water and an onion and for the purple dye you'll need a vial of water and a delphinium flower. Onions can either be pickpocketed or bought from Xuan in Varrock Square. Vials can be found in the Varrock castle kitchen shelves (and can also be filled in the kitchen too). Delphinium flowers are trickier to get - they must be grown from seed. Speak to Ellamaria in Varrock Castle for some seeds. Plant the seeds and then water them with a watering can (bought from the General Store). After watering, the flowers should be able to be picked. Return the ingredients to Thessalia, who will give you the dyes. Dying the red mist with blue dye will result in a purple mist, and dying the red mist with a yellow dye will result in an orange mist. With your new mists, enter the northwestern most room on the ground floor. Search Zemouregal's desk for the new code. Head upstairs, grab some decoder strips if you don't have nay, and enter the northeastern most room. This is Zemouregal's bedroom. Search his footlocker for a key . Now enter the vault door and wield your mithril crossbow and grapple. You should run into several beams of lights that will sound an alarm if broken. No problem though, you've done this before! Grapple the chandelier. Once over the lights, unlock the door with the four digit code you found earlier. Enter the door and grab Arrav's heart. Return Arrav his heart and he will say he needs his shield (the Shield of Arrav). Return to Varrock Museum and attempt to take the shield from it's display case. Orlando Smith will stop you. You'll need to end up distracting him by pressing the red button near the snake statue. When you have done this, quickly pickpocket the curator and grab the Shield of Arrav. Hand this to Arrav, who will now vow to spill Zemouregal's guts. You will now be playing as Arrav. Your first enemy is Zemouregal's gargoyle. He should be killed with relative ease - use the rejuvenate ability if you are having difficulty with the fight. 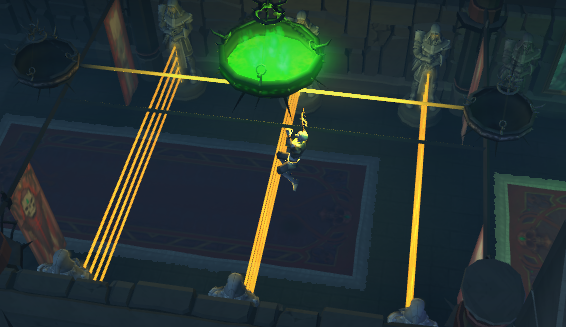 The gargoyle will drop a healing orb. Climb upstairs and after the cutscene run up onto the platform. Turn auto retaliate off and then face Zemouregal. Get rid of the protection portals and then attack Zemouregal (each protection portal drops a healing orb which heals 10% of your max lifepoints). After a time, Zemouregal will begin to summon undead cows. These cows will explode and hit 1500 damage if you are near them. You can either avoid them and wait for them to explode or kill them before they explode. Eventually, Zemouregal will summon a ton of protection portals which you will need to get rid of. They can be attacked, but the best way to get rid of them is to get the undead cows to explode near them. This can be done by luring them over portals. Continue to avoid the cows themselves. Don't forget - you are wearing a shield! Make use of shield abilities such as resonance, reflect, etc. After you have destroyed the large bunch of protection portals, Zemouregal will continue to summon undead cows constantly from one location. Stand as far from this location as you can and use the immortality ability if possible (as it is easy to die in this last leg of the fight). Once you have killed Zemouregal, Arrav will rush out to thank you for helping free his people and then collapse. On that happy note, congratulations, Subquest Complete! Speak to Gypsy Aris. She will look into New Varrock, which is now at peace. Following this, you will complete the quest. Silver pennies are used to buy rewards from Gypsy Aris' rewards shop. The shop sells an upgrade to Darklight, experience lamps, and cosmetics. Silver pennies can be obtained by replaying the quest. On first look, it appears that the upgraded Darklight has the same stats as the normal Darklight. This does not hold true when you deal with demons. The upgraded Darklight is about 50% than the normal Darklight at accuracy, strength, and its special attack.